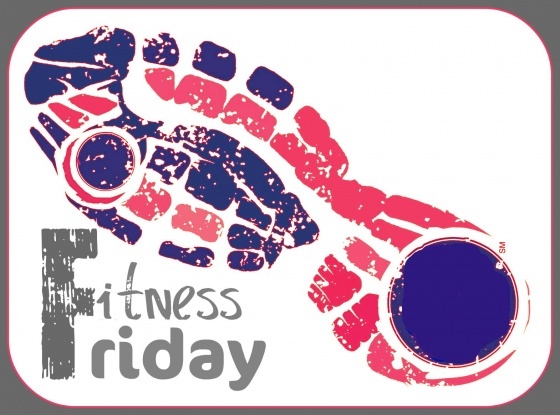 If you’re new to Foodie Fresh, Fitness Friday is where I give a run down of what I did to stay active all week, beginning last Friday. Friday is supposed to be my day of rest, but I follow rules loosely at best. So I rearranged my schedule and made Thursday rest day and Friday became a quick strength training day with my newest Jackie Warner video. It was tough! 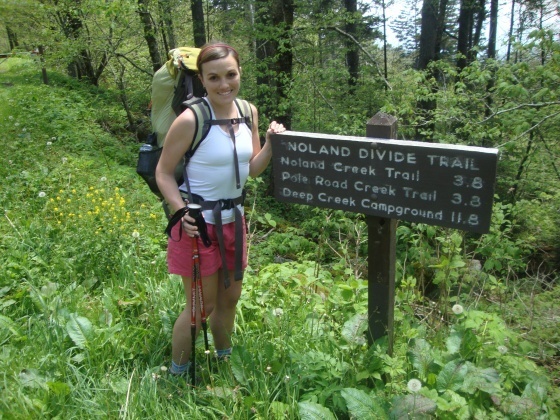 I spent Saturday and Sunday on a backpacking adventure with Brad in Great Smoky Mountain National Park. We hiked a total of fourteen miles over the two days, and because we hiked a back and out trail, we also covered a 4,000 feet decline and incline. 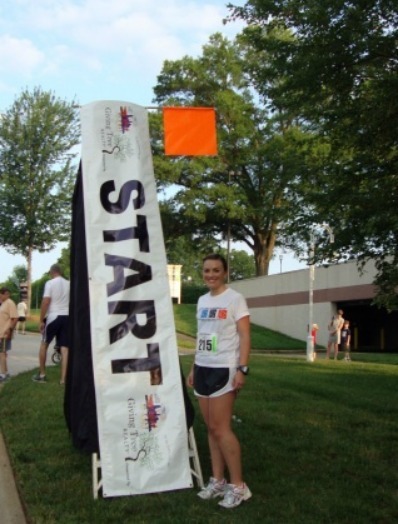 Monday was Memorial Day and the day of the Patriot 5K. I PR’d with a 24:38 and my other stats were pretty nice too (check them out in my race recap). Small races are a great ego booster. 😉 This race prompted me to consider where I am in my racing and where I want to be; what I’m doing right and what I need to work on. I’ll be sure to share more about this later as I formulate a plan. On Tuesday I ran 2.5 miles in the morning; then that evening I tried a new-to-me yoga studio. Dharma Lounge isn’t actually a yoga studio, it’s actually a night club that gives back to the community by offering *free* yoga three times a week. It describes itself as “nightlife enlightened – an eclectic and enchanting fusion of art, entertainment, music and musing”. I LOVE that they offer free yoga! The cost is the most deterring factor of why I’ve never purchased a pass at a yoga studio. Of course, Dharma Lounge couldn’t get by with giving away yoga at no cost, so they ask that you make a small donation (~$5). I usually take $5 classes at other studios, so I’m not really coming out any cheaper. However, the best part about Dharma Lounge’s yoga classes is that they’re extremely more convenient for my schedule. Their classes are Tuesday and Thursday 6:30-8 pm and Saturday from 12-1:30 pm. Plus it’s way closer to my house and the condo. The power classes aren’t truly “hot” classes, but they keep the room pretty warm, so if you try it, expect a lot of sweating. The class was more conversational. The instructor (who I loved! :)) spoke to us about getting through the pain when holding a pose. She told us stories. She made us laugh. People answered aloud when she asked questions. It was a less serene than the classes I’m used to attending; more laid-back, but just as challenging. I liked the energy of the class a lot and just might find myself there next Tuesday as well. On Wednesday I rested, in favor of sipping beer on a patio with Brad and Rascal (just a taste for Rascal!) and because I had workout plans the rest of the week. I made plans early in the week to do some trail running with my friend Michelle at the National White Water Center (WWC) on Thursday, the same place I did my trail race two weekends ago. The weather had cooled off significantly by the time we made it out to the WWC around 6:45 pm, due to the thunderstorm that seemed to be approaching us. It was still plenty humid so Michelle and I were pretty disgusting a couple of miles in. We didn’t really know where we were going, so we kind of winged it in hopes that we didn’t get lost. When we came to a fork about 3 miles in, I chose the right path, tripped on a root, and slid into home head first, which just happened to be a rock that I narrowly missed. Here’s the cleaned up version of my knee. The back of my left arm is raw with dirt burn and I have a small place on my side as well. Nothing to call home about. I managed to mostly run the rest of the two miles. We completed five miles in all, then I headed straight for the bathroom to clean up because I was covered in red dirt and sticky sweat. Of course, all wounds look worse the next day, but my knee is just a little sore. Hopefully nothing that will keep me from doing a longer run on Saturday morning. – I had plans to workout with Jenn today, but the poor thing’s bike was stolen, and she’s spending the afternoon trying to see if she can track it down. Go give her some love to brighten her day! I plan to do a circuit strength training workout after work, since yoga is the only work I’ve done to my muscles this week. – On Saturday, I hope to get in a long run and Brad is going to go for three miles; the longest distance he has attempted since his injury! Yay Brad! – Sunday is up in the air – maybe yoga? maybe bike riding? We shall see! I will most likely have a plan for it by the time it rolls around, because when I fail to plan, I plan to fail (when it comes to exercise). – Monday will probably be a running day and Tuesday will most likely be another Dharma power yoga class. – Wednesday and Thursday are running group nights so I expect to attend one of the meet ups. – I also expect to continue to run with Brad a couple of mornings during the week while he builds his mileage and get in at least one strength training circuit besides the workout I do today. Do you plan out your fitness for the week or do you just wing it? Like I said before, without even a tentative plan, I am far less successful in exercising consistently throughout the week. So planning works best for me! 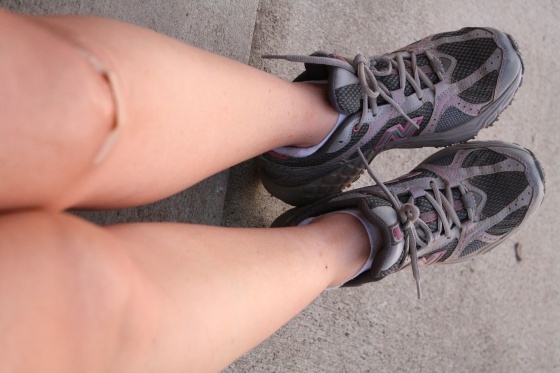 Tripping and falling is sort of like a trail running initiation. My first trail race was also my first ever half marathon and I definitely bit it hard! I finished the race with bloody knees but it was awesome!